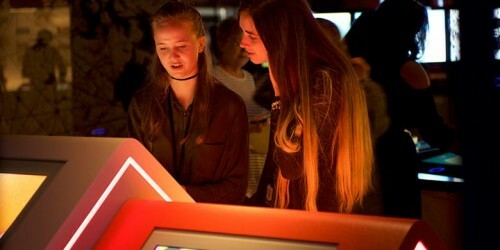 Since money is handled daily by people across the country, it offers an opportunity to communicate directly with the public; not only messages of national importance, but also expressions of personal interest. 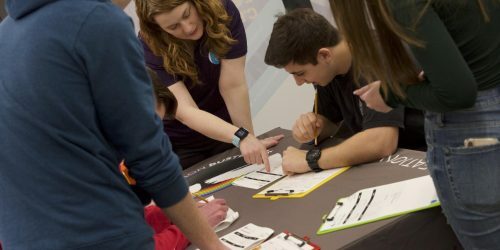 On occasion, Canadians have used money as a signboard for political protest, a platform for social commentary and even as a handy notepad on which to record fleeting thoughts before they are lost. Authorities frown upon this practice because money so treated has to be replaced—leading to higher production costs. 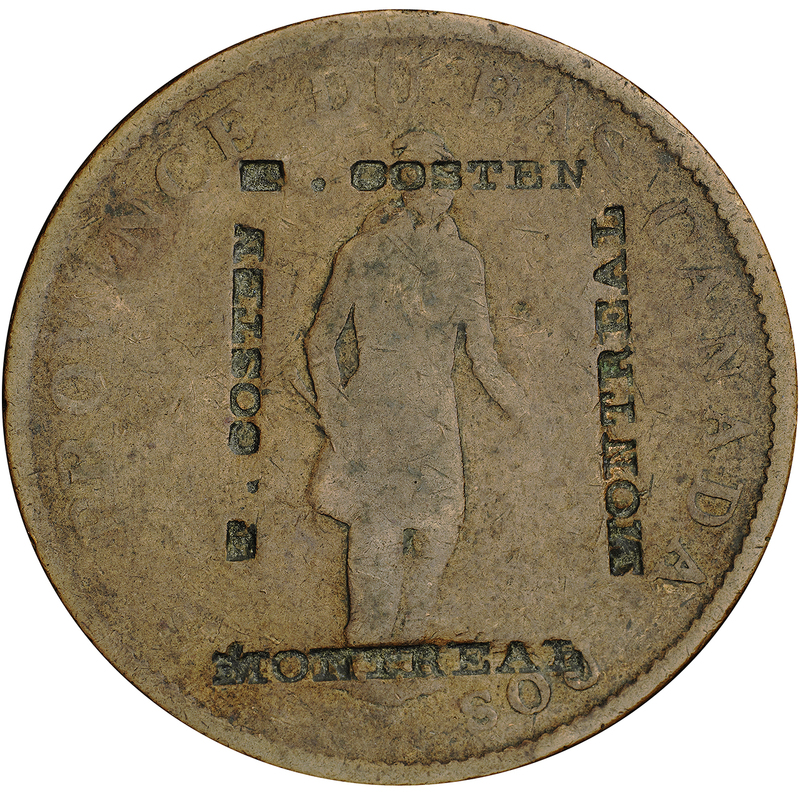 Recently, the Collection acquired a rare example of one marked coin that speaks to the nature of currency in Montréal on the eve of Confederation. The coin is an American half-dollar of 1853—the highest denomination to bear the name of L.C. Barbeau and the only known example. The 1853 U.S. half dollar counterstamped by L.C. Barbeau. Note that it’s bilingual. L. C. Barbeau was a dry goods merchant in Montréal. According to period directories, he operated a business on St. Paul Street from about 1852 to 1859, after which his name disappears from the city records. During this period, he advertised his business by having his name and profession impressed onto coins and tokens—a practice called counterstamping. The odd thing is that he advertised his services as a broker rather than as a dry goods merchant. 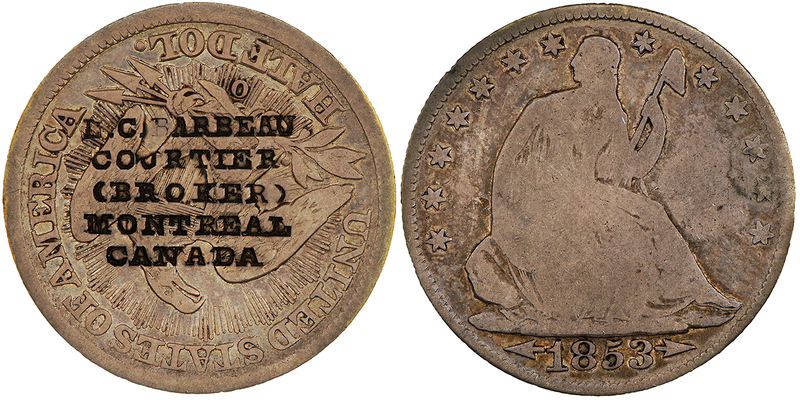 The different coins and tokens that bear Barbeau’s name testify to the diversity of money in circulation in Montréal during the 1850s. 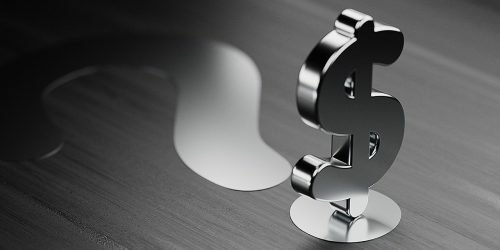 Known examples include English sixpence pieces of George III and William IV, a Bank of Montreal half-penny token from 1844, a U.S. hard times token from the late 1830s, Canadian 1 cent pieces from 1859 and two contemporary American silver coins: a quarter and half dollar. 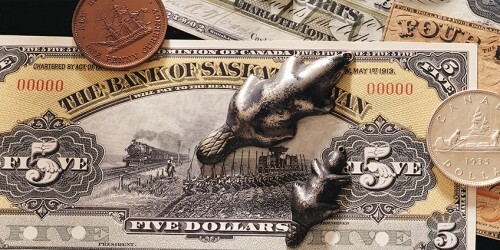 The latter two pieces indicate the prevalence of American money in circulation, a situation that was to assume monumental proportions by the late 1860s owing to American purchases in Canada during the Civil War. 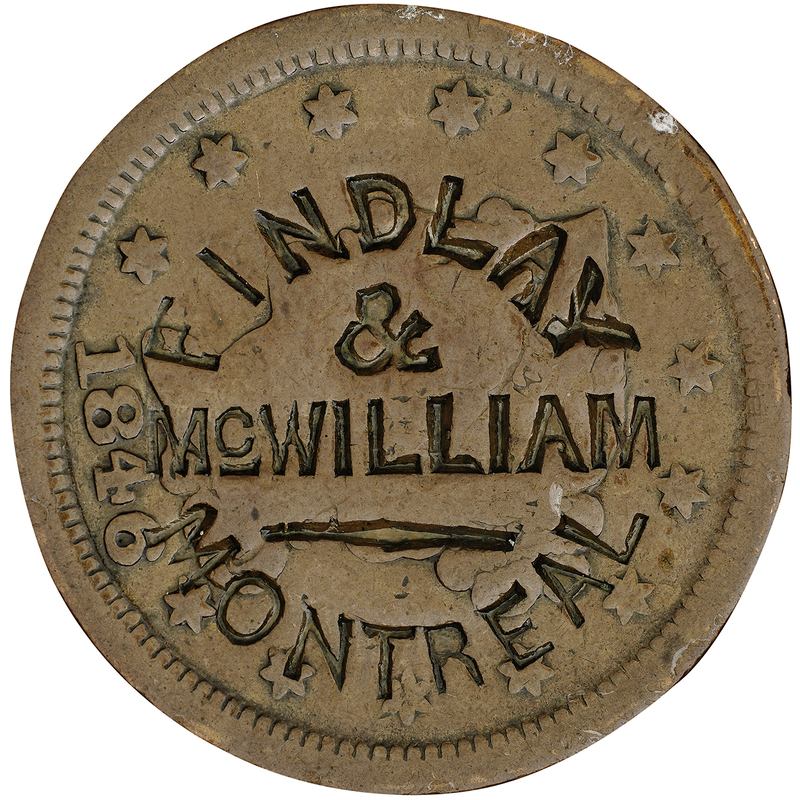 Confectioner Findlay & McWilliam counterstamped this American 1 cent piece of 1846. Canada City Bank half-penny token of 1837 stamped by T. Costen, a Montréal gunsmith. Barbeau was not alone in counterstamping coins and tokens. Other 19th century Canadian businesses employed similar practices. 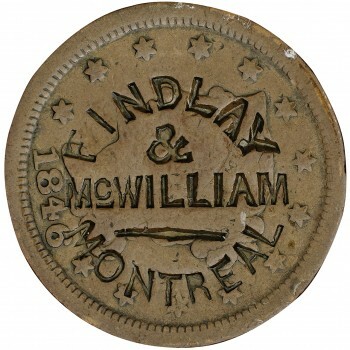 Montréal firms known to have issued counterstamped pieces include Findlay & McWilliams (confectioners), T. Costen (gunsmith), Paquette & Cie (manufacturer), and Devins & Bolton (druggists). The most prolific producers of this sort of advertising, Devins & Bolton circulated large numbers of advertising pieces during the 1860s. More than 149 different types of coins and tokens bear their counterstamp. 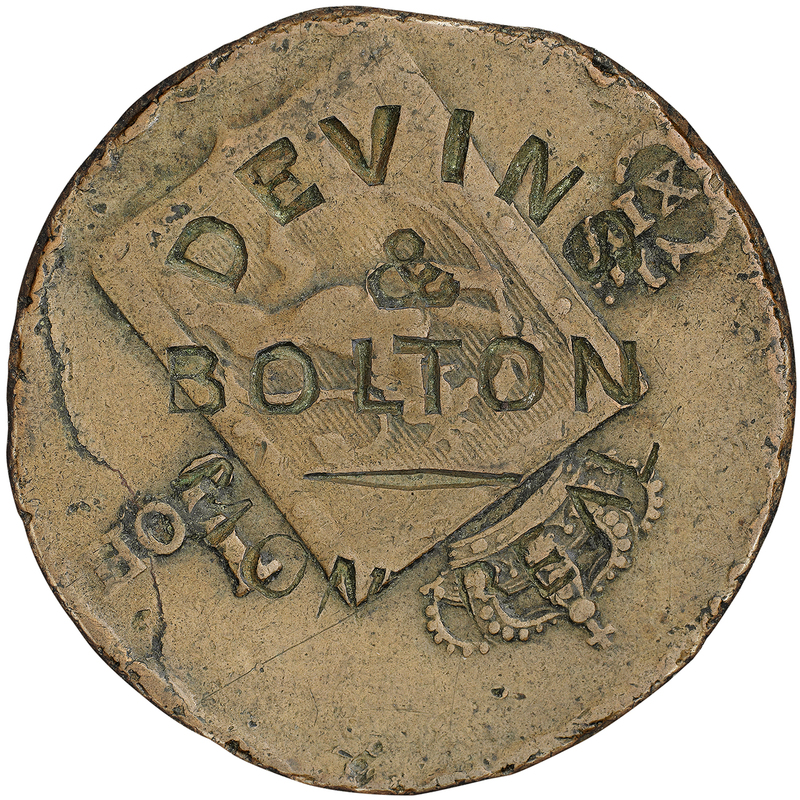 One of the many Devins & Bolton counterstamped coins: a Norwegian 1 skilling from 1833. Notankers.ca is an organization raising awareness of the controversial transportation of crude oil through British Columbia and the Pacific. This sort of “guerrilla advertising” still exists today, often for promoting social change. The initiative to move crude oil to the Pacific coast in a pipeline has proven controversial. 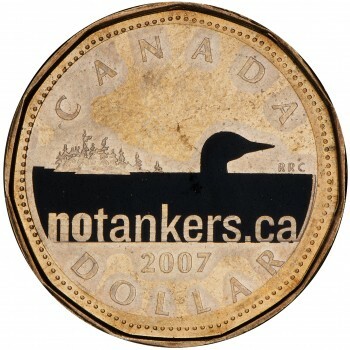 In 2009, citizens concerned about oil tankers and pipelines affixed black stickers to dollar coins creating the appearance of a loon covered in oil swimming on the surface of an oil slick. 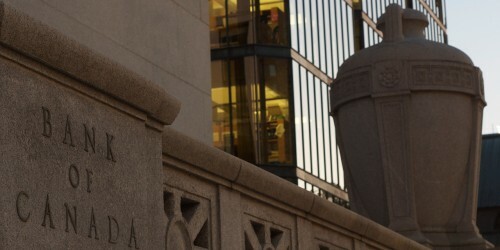 Beginning in the late 1990s, private parties interested in the circulation of money created websites to track the movement of bills. Notes were overprinted with instructions to the note holder to go online and register where each note had been used. You really can see where this bill has been at Canadian Money Tracker (if you could read the serial number). 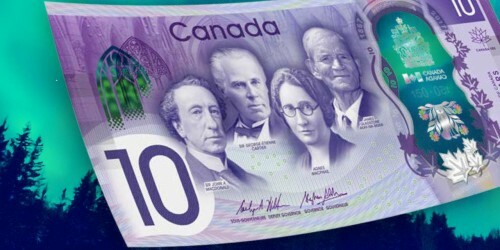 Although this note is most probably long out of circulation, interesting statistics may still exist for it on Canadian Money Tracker. 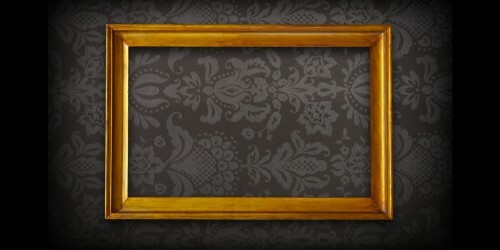 There are very good reasons why you shouldn't deface or mutilate a bank note, even though it is not actually illegal. 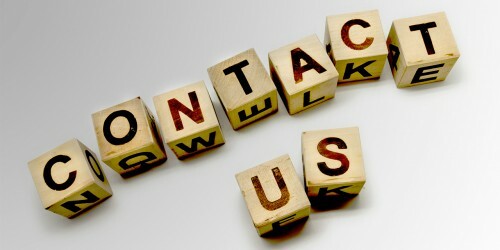 Defacement may interfere with the note's security features, reduce its lifespan or even make it unacceptable in a transaction. 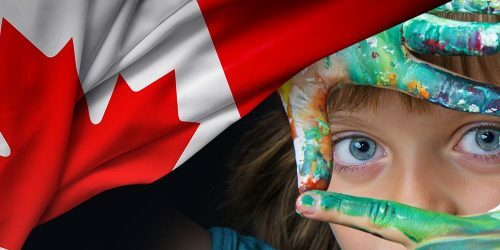 The Bank of Canada also feels that marking on or mutilating bank notes is simply an inappropriate act as they are a symbol of our country and source of pride.